Location: Great Wolford , Nr Moreton-in-Marsh, Cotswolds. Features: · Open fires · Enclosed garden · Pub in Village · Games room - Luxury bathrooms . Modern kitchen· Village church. This handsome detached house stands on the center of the picturesque village of Great Wolford, which sits amongst some of the quietest and prettiest farming countryside in England, yet only 2.5 miles to the market town of Moreton-in-Marsh. From the winter snow to the gold of autumn - there are not many nicer places to spend .The property has a stunning interior yet full of charm with an array of bedrooms and sleeping possibilities for up to 8 people. Further features include its games room/dining room, two sitting rooms and French doors which lead out onto a garden for guests' personal use. Moreton-in-Marsh, with its broad High Street and range of specialist shops, is an ideal place to shop and browse in the many antique shops. The towns and villages of the Cotswolds are a delight to tour, with stunning countryside in all directions. Burford, has an excellent wildlife park and the pretty town itself is a pleasure to browse around, whilst at Stratford-upon-Avon, daily guided tours are offered to all the places of interest in this World Heritage City of Shakespearian fame. For alternative days out, Oxford is easily accessible, as is Cheltenham. Blenheim Palace is within 10miles. Take a short drive in any direction and you start to discover the beauty of the Cotswolds. Gentle countryside, idyllic villages, busy market towns, simple country pubs, and stylish shops, boutiques, cafes, and restaurants. There are wildlife and water parks nearby for entertainment and adventure, and heritage sites, country houses, and classic formal gardens and parks to explore. At the end of the day, wherever your tastes may have taken you, there’s the pleasure of knowing that you can once again retreat to the restful luxury of your own private house and garden. toilet, shower, Slipper bath with hand shower shown in photos. toilet, located on the ground floor with toilet and hand basin. Separate seats 8 also doubles as a games room with a childrens pool table and several board games, numerous books for all ages. A decked terrace directly off the kitchen leading on to the lawned garden. Perfect for outside dinning. We also include a selection of teas and coffees, organic milk, sugar, salt, pepper, dishwasher tablets, washing up liquid, tea towels, washing up cloth, toilet rolls, foil and cling film. All located in the kitchen cupboard. Everything you need to get you started on your arrival. Initial firewood to enjoy a cozy fire in the delightful Inglenook sitting room. Easy experience from start to finish! Comfiest beds and lots of little touches. Thankyou! Exactly what we were hoping for! Would highly recommend and would like to return here soon. Communication prior to our stay was excellent. The owners had generously given us helpful cleaning products and basic food supplies as well as daffodils on the table as it was St David’s Day. We loved the house! It was perfect for a group of 8 adults, two cosy sitting rooms, good sized kitchen and dining room. The back garden was very well kept. Parking wasn’t a problem. So happy to get such a lovely response from our guests. We do go the extra mile to make guests have a great stay. The garden is beautiful all year round and great care is taken to keep it as confortable as possible. The same goes for the house which is perfect for at all times of the year. We loved our stay at Teachers House. The house is beautiful, clean, cosy, and gorgeous garden. It is lovely and peaceful, and lovely for an 'escape from it all' break. Comfortable house perfect for a weekend getaway. Lovely comfortable house, great furnishings , plenty of space everything we needed for a friends getaway....wine and chocs a great treat. Thank you. Thank you for such a lovely review. We are happy to hear that you loved The complimentary wine and chocolates at The Teachers House and that you had a great get together with some old friends. My wife and I and our three teen-aged children ushered in the New Year with a weeklong stay at Teacher's House. 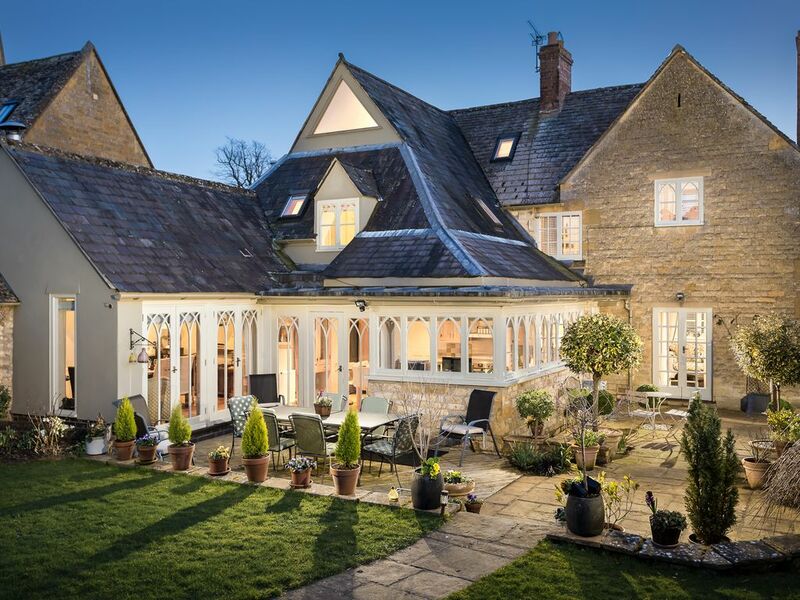 The house is charming, immaculately maintained, and in a wonderful location for exploring the Cotswolds. The house sits in Great Wolford, a small, quiet village with no commercial activity, surrounded by beautiful rolling pastures. Moreton-in-Marsh is a 7-10 minute drive for groceries and other supplies. Pleasant country walks set out from the churchyard across the street. Given the time of year, we could not take advantage of the attractive back garden, but we did make full use, upon our return from our walks, of the comfortable sitting room with working fireplace. The owners and caretaker go the extra mile to make their guests feel welcome -- in our case, we had a decorated Christmas tree by the fire, and a bottle of champagne laid out on the kitchen table. This attention to detail was emblematic of the care that clearly goes into maintaining the home. All in all, a truly memorable week. For your information 'Teachers' is situated in the picturesque village of Gt Wolford, which sit amongst some of the quietest and prettiest farming countryside in England, yet only 2.5 miles to the market town of Moreton-in-Marsh. From the winter snow to the gold of autumn - there are not many nicer places to spend some time.